As part of the consideration when I recently upgraded the Dahon Boardwalk from 10 speed to 11 speed, one of the reasons was to free up the 10 speed Di2 components for another bike. This other bike would be the Dahon MuEX! The Dahon MuEX was first built to prove that it is possible to build a high performance and lightweight folding bike at an affordable price. This project was successfully completed, with a 20 speed, 9.4kg folding bike costing $1700. 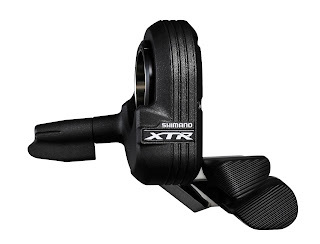 With the launch of the new XTR M9050 Di2 system, there is a component which caught my eye, and that is the new electronic shifter. These are flat handlebar Di2 shifters for the XTR Di2 groupset, but it can also be used with other Di2 components. 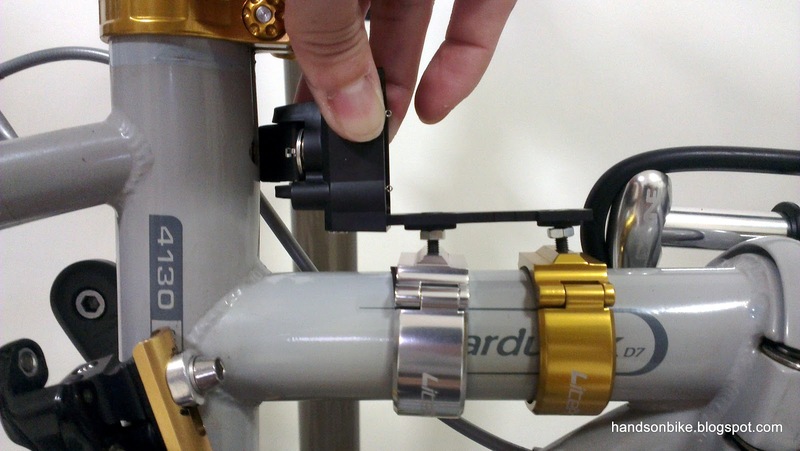 It would be really interesting to try out these shifters and see how well it works on a flat handlebar Di2 bike. As shown by this compatibility chart, it is possible to match these Di2 shifters with other road components, such as the 10 speed Ultegra 6770 Di2 components. Of course, before purchasing all the required components, it is necessary to ensure that all the components will work and fit on the MuEX frame. Prior to upgrading the Dahon Boardwalk from 10 to 11 speeds, I had already tried out installing the 10 speed Ultegra 6770 Di2 components on the MuEX frame. The major concern I had was whether the bulky Ultegra 6770 Di2 front derailleur will fit on the MuEX frame. Testing out the Ultegra 6770 Di2 Front Derailleur on the MuEX frame. Very small gap between the FD and the frame! Also, very small gap between the FD and the right crank arm. 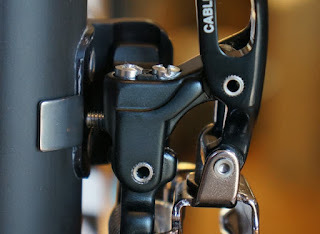 The solution is to add a BB spacer under the right side BB adapter to push out the crank a bit more. As can be seen from the pictures above, the FD barely fits onto the MuEX frame, and it has very small clearances with the frame and the crank arm. I had previously found that the FD hanger seems to be welded slightly too far out from the frame seat tube, which contributed to these scenarios. In a way, this is good as it gave sufficient clearance between the frame and the FD. As for the clearance between the FD and the right crank arm, it can be increased by adding a BB spacer to push the right crank arm slightly further outwards. As for the FD support bolt, I found that it seems to be slightly too short to reach the frame. This support bolt is supposed to touch the frame, to stiffen up the FD and give better shifting. 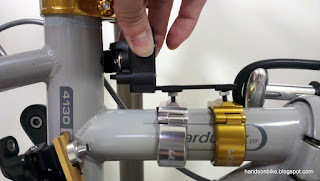 Now that the FD mounting is no longer a problem, let us check the other components. The rear derailleur will go on as per normal, no special mounting or clearance issues. Same for the XTR Di2 shifters. As for the mounting of the Junction B and the Di2 wire routing, I can follow the setup used on the Dahon Boardwalk, so no problem there. This leaves the mounting of the Di2 battery as the major problem here. On the Dahon Boardwalk, I used 2 FD adapter clamps on the frame of the Boardwalk to create a fixing point for the battery mount. However, I cannot do the same on the MuEX frame as the frame shape is not cylindrical. Di2 battery mounting on the Dahon Boardwalk, created by 2 FD adapter clamps. In this case, the only way is to create my own mounting point for the Di2 battery mount. What it needs is just two threaded M4 holes that are spaced about 33-42mm apart. My idea is to take an aluminium block, tap the M4 threads, and have slots to allow the DIY mount to be tied to the MuEX frame. Aluminium block, with two M4 threaded holes, and 2 crude slots for inserting cable ties. The block was spray painted black after the machining work was completed. Fits the battery mount nicely! A rubber shim was added between the DIY battery mount and the frame, and then the whole thing was tied to the frame using cable ties. This mount is actually quite secure as it does not move around even when the bike lands hard on the ground. Seems that it will work! Now that the key components have been checked for compatibility with the Dahon MuEX frame, the next step is to gather all the required components and update the firmware, before installing them onto the frame. To be continued!